Over the past year-and-a-half, the Age of the Gods online video slot series has proven itself to be one of the most popular games ever released by Playtech. The series was originally designed to replace the successful Marvel online slot series. However, Age of Gods has outgrown its predecessor. In a move that has caused a progressive storm in the gaming industry, Playtech last month released its Age of the Gods Live Roulette to add to the online slots series. Featuring a beautiful theme, a unique spin on Roulette and a massive payout potential, Age of the Gods Live Roulette has already proved a huge hit with players at Bet365 and William Hill Online Casinos. Playtech launched the Age of the Gods Live Roulette (including its 4-tiered Age of the Gods Mystery Jackpot) to add to its Age of the Gods slots family on 27 September 2017. Just two weeks after the introduction of Age of the Gods Live Roulette, a hard-working British factory worker and father of three won CAD$790 000 whilst relaxing after a long and difficult night shift. Shimon Akad, Chief Operations Officer at Playtech, said: “We continue to drive innovation and our new Age of the Gods Live roulette product is testament to that with the product becoming an instant success. Playtech has broken new ground in traditional Online Casino circles with its Age of the Gods Live Roulette. The concept is so simple. It’ll leave you scratching your head wondering why it wasn’t thought of before now. 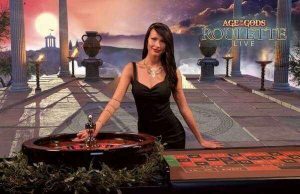 Quite simply put, Age of the Gods Live Roulette shares liquidity with all its online casino and land based slot machine brothers. The largest jackpot available is the Ultimate Power Jackpot, the highest of the four-tier mystery jackpot that links all the live products and all of Playtech’s Age of the Gods slot games. This ensures players have a larger prize pool that can be obtained more often as it is played more often. That what makes this roulette game unique. Age of the Gods Live Roulette shares the progressive jackpots with its slot machine counterparts. Quite often, roulette games are often criticised for their lack of jackpot winning opportunities – but not with Age of Gods. Just like progressive slots, the jackpot round is activated at random. Upon entering the jackpot round, you are greeted with 20 coins, all face down. Flip those coins to reveal different colours – colours that may potentially match up to one of the four available jackpots. In the case of the Ultimate Power jackpot, you will be required to flip as many reds as possible. As if to underline the point and prove it possible, a player at Bet365 Online Casino immediately won almost CAD$ 70 000 a mere few hours after the game went live in September. Knowing the professional-level games developed at Playtech, it won’t come as any surprise that this game is mobile friendly. The browser-based design ensures compatibility with all major mobile devices, including both iOS and Android products. Age of the Gods Live Roulette rewards players with its superb play action. Its visuals run smoothly, elegantly and stylishly without jerking or loading issues. You’ll know Age of the Gods Roulette is unique at first glance. While the betting table and roulette wheel look standard enough, the backdrop of the game is covered with an array of colourful gods, goddesses and Grecian urns, and lanterns, that make it appear that the game is taking place in Zeus’ temple on top of Mount Olympus. This makes Age of the Gods far more engaging and eye-catching than the usual green or red felt table-top we have become accustomed to seeing at online casinos. The entire look and feel of the game, including a new dynamic user interface is designed to showcase the jackpot ticker and present real-time jackpot notifications. It has stylistically-developed to fit in with the rest of the Age of the Gods series of games, including the online slots. The most impressive element is the state-of-the-art 26-metre high custom-built video wall in Playtech’s Riga, Latvia studio. This enhances smooth gameplay allowing Playtech staff to render any imagery required to support the game as it is streamed live. Sharing a jackpot liquidity across the company’s game portfolio is just the first step in Playtech’s bold and ambitious plans to offer its customers a new, completely revolutionary and unique online gaming experience. The Isle of Man-based gambling giant has drawn up a strategy to revolutionise the Live Roulette experience through its in-house developed ONE platform, which will offer a total of four jackpots on each spin. New Live Roulette tables will be offered to the company’s partners and should make the market more competitive and its certain players will benefit from more jackpots being won more often. Even if you know nothing about the Age of the Gods series of games, Age of the Gods Live Roulette is a super-fun and unique interactive online roulette experience. By triggering the jackpot mini game at any point, you are guaranteed to take home one of the 4 progressive jackpots. The progressive jackpot-sharing with its slot machine relatives is a revolutionary and innovative idea. Players are entertained and on the edge of their seats for hours on end, fully aware that a life-changing win could be on their way on their very next bet. Check it out today at William Hill online casinos!